Tony Rogers, a 45-year old graphic designer from Burgess Hill, UK won a package to PokerStars Festival Lille (July 15-23) thanks to his win in the $2 Big Race poker tournament. The victory entered him into a Royal Ascot Gold Cup sweepstake that gave him the winning horse Big Orange gifting him a €1,825 Festival package. Rogers will head to Lille bringing his wife and parents to rail him while he contests the €600,000 guaranteed prize pool in the PokerStars Festival Lille Main Event. Combining an idyllic winter setting with 12 days of big money poker, PokerStars Championship Prague will see out 2017 in style this December 7-18 with €7,000,000 guaranteed in tournaments: €5,000,000 guaranteed in the PokerStars Championship Main Event and €2,000,000 guaranteed in the PokerStars National Championship. During their downtime, players can also soak in the festive atmosphere at the world-famous Christmas markets. Amount won by Andreas ‘daskalos20’ Christoforou from Cyprus during the Sunday Million. Christoforou defeated 5,764 players for the largest slice of the guarantee-busting $1,152,800 prize pool. The latest PokerStars Festival Main Event champion is Ignacio López, who defeated Iñigo Naveiro heads-up, and Leo Margets before that, along with 946 other players, for a €152,400 pay-out in the €1,100 PokerStars Festival Marbella Main Event where the total prize pool was €911,040. Five PokerStars Festival Bucharest Main Event packages worth €2,000 are guaranteed from the €27 Special Qualifier which takes place this Sunday, July 2 at 12:15pm ET. The Special Qualifier is available to .COM players and PokerStars will be providing free tickets to all Eureka Bucharest 2016 .COM qualifiers. The PokerStars Festival Bucharest Main Event will take place at the JW Marriott Bucharest Grand Hotel from August 2-6, 2017 and will guarantee a €500,000 prize pool. In recognition of the growing community of players participating in discussion and voice chat platform Discord, PokerStars is offering a freeroll on Saturday, July 1 at 1pm ET that awards five seats in the Road to Barcelona Ultra Qualifier taking place the following day (July 2). The seats are worth €215 each, totalling over €1,000 in value being given away by PokerStars. Total buy-in for the PokerStars Festival Main Event in Uruguay taking place September 18-22. The final Latin American stop of 2017 heads to the stunning resort city of Punta del Este (Sept 16-23). The luxurious Conrad Hotel & Casino will play host to the event and offer a variety of tournaments such as the $3,300 PokerStars Festival High Roller, $440 PokerStars Cup and the $220 PokerStars Open. On October 21, 2017, the New Jersey Chapter of Autism Speaks will host the Chip In for Autism event in Jersey City. The event will honor Bill and Michele Sorvino along with Kerry Magro for their dedication and commitment to Autism Speaks. The event will feature a cocktail reception, open bar, raffle, poker, and casino style table games. The top poker winners will have the opportunity to win technology products including smartphones, virtual reality devices, smart- watches, tablets and more. To reserve your tickets, please register at Autism Speaks. 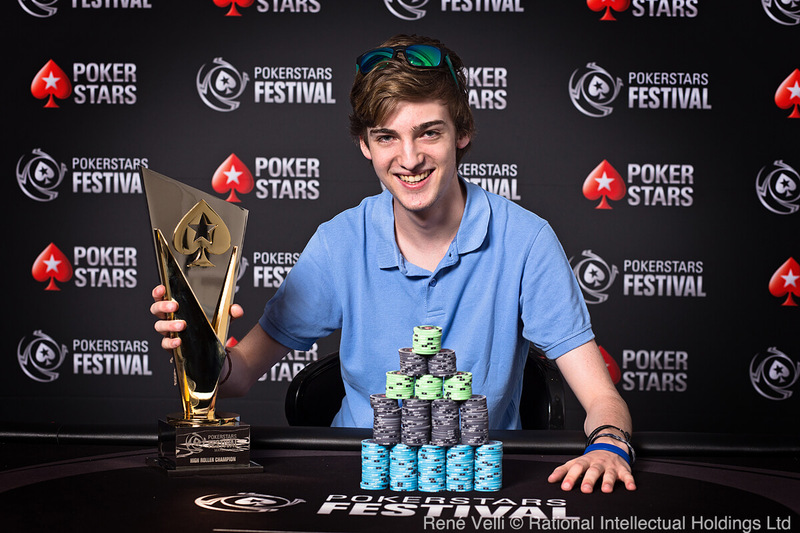 Spain’s 20-year-old Oriol Fernández has become the PokerStars Festival Marbella €2,200 High Roller champion taking home a gold trophy, a live title, and €78,200. Snooker legend Stephen Hendry travelled to PokerStars Festival Marbella for a week of sun, poker and a pool challenge from Team PokerStars Online member Lex Veldhuis. Find out who took down the bragging rights in this video.